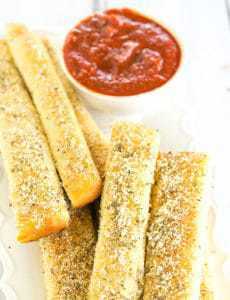 These are such an awesome recreation of Pizza Hut's amazing breadsticks. Buttery, soft with lots of seasonings! Coat the bottoms of two 9x13-inch pans with 4 tablespoons each of the melted butter. Roll each piece of dough into a 9x13-inch rectangle and fit in the bottom of each pan. Brush the tops of the dough with 1 tablespoon melted butter each. Wrap tightly in plastic wrap and place in a warm, draft-free area until puffed and nearly doubled in size, about 90 minutes. Note: You can also mix and knead this dough by hand - just knead until a smooth, slightly tacky ball forms.